Passengers can be a huge distraction for drivers, especially newly licensed, inexperienced drivers. When you first start driving on your own, you simply don’t have the experience you need to operate a vehicle safely and deal with passenger distractions. Let’s review the facts, and some tips for drivers and passengers to stay safe. Remember passengers are killed in teen driver crashes too. Research has shown that crash risk and risk of being killed in a crash increases as the number of young passengers in the vehicle increases. Over two out of four teens that died as passengers are in vehicles driven by other teens. 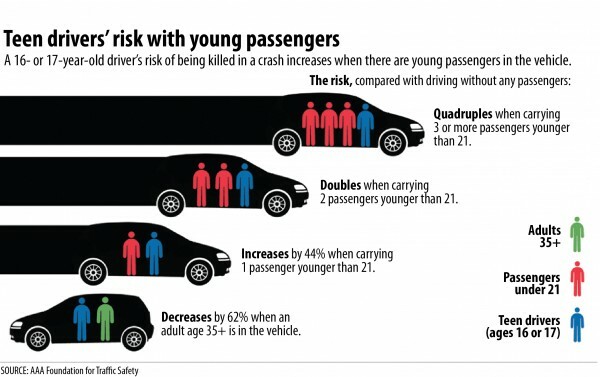 The AAA Foundation for Traffic Safety reports that risk of 16- or 17-year old driver being killed in a crash increases risk increases 44 percent with one passenger; it doubles with two passengers and quadruples with three or more passengers. Obey your state’s Graduated License Law. It explains how many and when you can have passengers in the car you are driving. Remember, your behavior is just as crucial as the driver’s. The following is a list of some useful tips to help you and others become better and more considerate passengers. Follow your state’s Graduated Driver Licensing law for passenger restrictions. If your state doesn’t have such a rule, limit the number of teen passengers your teen can have to zero or one. Even if you’re a passenger in the backseat. Did you know that people not wearing a seat belt are 30 times more likely to be ejected from a vehicle during a crash? And in fatal crashes, more than three out of four people who are ejected die from their injuries. Do you really need to make that phone call now and be THAT loud? Don’t be that obnoxious passenger screaming on your phone at someone. Call them back. It can be a huge distraction because whether you think so or not, the driver hears you. So save the call for later – even if it’s real juicy gossip. If the driver is expecting or needs to send an important message, be the Designated Texter, handle all incoming and outgoing messages, and let the driver focus on the road. Listening to the radio while driving makes the journey more enjoyable. Just don’t that the driver wants to listen to everything that you want to listen to. Let the driver to choose what they want to listen to. Especially if it’s a short trip. Attention control freaks: Keep your comments to yourself and never grab the steering wheel. Save them and your expert driving advice for after the ride. No one likes a backseat driver. We all make mistakes (well, almost all of us.) When you’re a passenger, you must always stay calm. Causing a scene by screaming at the top of your lungs will not help the situation. Just like the driver, you deserve to be treated with consideration and feel safe. So if the driver is speeding or driving recklessly, don’t be shy about asking him or her to slow down and drive more carefully. Politely. Nobody likes being yelled at. A driver under the influence puts themselves in great danger of crashing, as well as hurting and possibly killing other people on the road and in their car. Drivers have no right putting other people’s lives in danger. So say something. Even if it is your BFF. Remember, Crash risk goes up when teens drive with other teens in the car.